There are about five different plays stuffed into this slender evening. 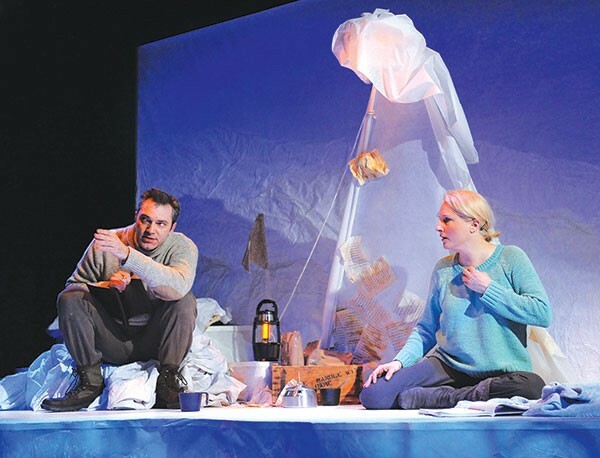 Tony Bingham and Amy Landis in Antarktikos, at the REP. I hate to open with this, but: SPOILER ALERT. 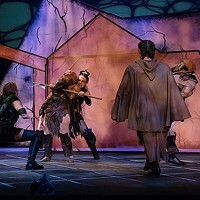 There's no way to discuss the Pittsburgh Playhouse REP's world premiere of Antarktikos, by Andrea Stolowitz, without giving away a little bit of a plot twist. So if you're planning on going and you like surprises, stop reading right now. Actually, the twist comes early and isn't that surprising. 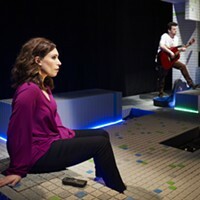 But it's also the most interesting thing about the play and I feel bad diminishing what little oomph the script has. But forward we march. Susan is a novelist of a certain age who, years ago, wrote one book and now is heading to Antarctica, where, thanks to all that snow-blasted isolation, she will attempt a second. Here's the twist: In reality, Susan, while riding a bike in her hometown, was hit by a bus and she's now in a coma, only imagining she's in Antarctica. And she's imagining a meeting with Robert Falcon Scott, a Victorian-era British explorer who led an expedition to the South Pole in 1912 and died there. 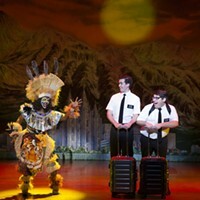 Antarktikos toggles back and forth between scenes of Susan and Robert ruminating on life, death and legacy (which is mildly interesting) while over on stage left, Alex and Hilary are falling in love. These latter scenes, I regret to say, are not so interesting, ineptly written and stuffed with cliché. Although, in the world of Hollywood "meet cute," meeting over the comatose body of your mother must count for something. From the start, it's clear that Antarktikos has been developed, workshopped and dramturged to death. Stolowitz's focus is all over the place. There are about five different plays stuffed into this slender evening, all of the characters feel like calculated conceits, and the final 10 minutes ... well, let's just move on. Stephanie Mayer-Staley's set is of such high caliber you can thankfully spend much of the play's intermissionless 100 minutes lost in her exquisite use of white-on-white shadow, given strong reinforcement by Todd Wren's lights and Steve Shapiro's sound design. Sheila McKenna directs with her usual ruthless honesty — there's not a moment in which this production isn't living fully inside this script. Billy Hepfinger manages to wring out a surprising amount of interest as the EMT. Meanwhile, Amy Landis and Tony Bingham, as Susan and Robert, create a few genuinely touching moments during their quiet, introspective scenes. There is, actually, an interesting story somewhere in here — namely the 100-year beatification, demolition and redemption of Robert Falcon Scott's reputation. (Google it, it's fascinating.) Maybe someone will write that.